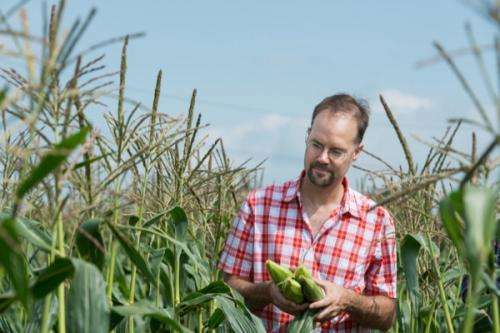 Male reproductive organ development in maize involves a complex array of ribonucleic acid molecules (RNAs) with potentially diverse activities in gene regulation, demonstrated by new research from the University of Delaware and Stanford University. In addition, this work suggests that the beginning phases of such development in maize and mammals – two very different life forms – have some intriguing molecular parallels. The research findings have been published in the Proceedings of the National Academy of Sciences (PNAS) by a team of scientists led at UD by Blake Meyers, chair of the Department of Plant and Soil Sciences in the College of Agriculture and Natural Resources and the Edward F. and Elizabeth Goodman Rosenberg Professor of Plant and Soil Sciences. The first author on the paper is Jixian Zhai, a former graduate student who worked with Meyers and is now a postdoctoral researcher at the University of California, Los Angeles (UCLA). Zhai was a 2014 recipient of the prestigious Life Science Research Foundation postdoctoral fellowship, sponsored by the Gordon and Betty Moore Foundation. Meyers collaborated with Virginia Walbot, professor in the Department of Biology at Stanford University, to characterize maize anthers—the male reproductive organs—that had been carefully staged through the developmental transition and were perfect for the molecular studies in which the UD team has specialized. The Walbot lab has a longstanding interest and expertise in anther development, and they work with a large collection of male-sterile maize mutants with altered anther development. Analysis of a subset of those mutants provided key insights in the study. "We were really excited to see the results when we noticed a tremendous increase in the abundance of these molecules that was perfectly timed to developmental transitions that take place in the anther," said Meyers. Their work built on and extended findings from data published earlier by other labs in a study focused on rice. That earlier study showed the abundance of some of the same molecules in reproductive tissues, but lacked the temporal resolution of the staged maize anthers used by the Meyers and Walbot labs and the spatial resolution provided by the mutants and other advanced localization techniques they employed. Because maize has a separate male inflorescence (the tassel) and female inflorescence (the ear), the researchers were able to study the male flower separate from the female flower, a further advantage over working in rice, which has combined male and female flowers. With Walbot's lab able to dissect the anthers at very precise stages—from their earliest origins when they are only a fraction of a millimeter in length all the way up to the mature anthers, which are about five millimeters—the research team was able to assess the developmental transition from early anthers to mature pollen. "We could see that these RNAs fell out into two classes: an early class and a middle-to-late class," said Meyers. Meyers explained that the early class corresponds to developmental events in which the cell types are becoming organized, defining the cellular architecture of the anther, whereas the later class corresponds exactly to meiosis, the process of production of the haploid microspores that ultimately mature into the pollen grains. "We could see that the increases in the abundance of these two groups of small RNAs exactly corresponded with those two developmental phases," said Meyers. Where this intersects with mammals and animal developmental biology is that there has been a lot of work in mammals on a very unusual class of small RNAs that are particularly abundant and enriched in male reproductive organs during early development. "These mammalian small RNAs, called piRNAs, have a very unique pathway for their production. Tremendously abundant and in mammals, there are two classes: an early class and a kind of middle to late class. We were intrigued to see in maize several analogous features; yet the plant and animal small RNAs abundant in male reproduction share no apparent common origin," said Meyers. "We think that they are independently evolved in the lineages of plants and in mammals." What the researchers don't know yet is whether there are analogies of function. "All we know for now is that there are several unusual similarities between these classes of RNAs. And to use these methods to characterize the unique yet analogous aspects of the plant reproductive small RNAs was a particularly rewarding part of the work," said Meyers. 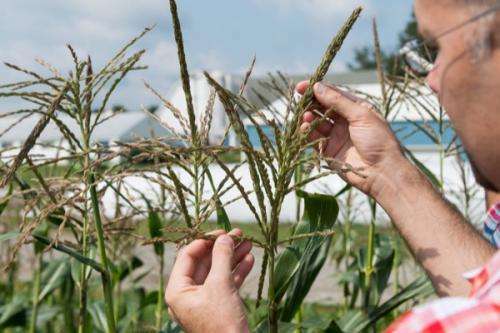 Maize and rice, the two plant species best characterized for these novel small RNAs, are in the branch of the plant kingdom that's known as the monocots, one of the major groups of flowering plants. Another major group of flowering plants—the eudicots—contains the plant species most studied at the molecular level, the model plant Arabidopsis thaliana. In Arabidopsis thaliana, however, there is no evidence that these two classes of small RNAs exist, let alone are enriched during anther development. Meyers was able to see this firsthand when he collaborated with a group at Cold Spring Harbor to look at small RNAs in Arabidopsis flowers. "That work gave us many insights into small RNAs and plant reproductive biology," said Meyers. "In that work, we looked at Arabidopsis flowers including comparable stages of anthers and there was no evidence for these classes of small RNAs that we saw in maize. We can conclude that there are distinct but abundant classes of small RNAs in these different lineages of plants." This means that maize and the Arabidopsis diverged in their use of small RNAs during evolution, and yet despite this evolutionary divergence, there are signs of a possible convergence between the grasses (i.e. maize) and animals in the use of small RNAs in reproduction. The paper also describes the development of a spatial map of the production of those small RNAs, combining their collaborators' expertise in anther biology with microscopy in the Bio-Imaging Center in the Delaware Biotechnology Institute (DBI). "Professor Walbot has collected many male sterile mutants of maize, plants defective, for a wide variety of reasons, in the production of mature, fertile pollen," said Meyers. "She was able to pick from this collection mutants that she thought would be particularly informative to identify the cell layers required for production of these small RNAs." A mature maize anther contains five cell types and the researchers looked at mutants that were defective in one or more cell layers to see if the production of the small RNAs was dependent on one or more of these layers. The researchers then combined that data from the mutant analysis with microscopic visualization techniques called in situ hybridizations that allowed them to probe dissected tissue for the presence of their RNAs of interest. "We could essentially say, 'The mutant analysis indicates that small RNA X is found in cell layer Y; if we use the dissected anther and we apply a labeled version of X, do we observe it in that cell layer?' These images took advantage of the advanced microscopy at DBI," said Meyers. With those data, the researchers were able to reveal specific cell layers required for production of the two classes of small RNAs, allowing them to validate the mutant analysis. One discrepancy in the mutant and hybridization results suggested that at least one set of small RNAs might move across cell layers – a result that they can test in future experiments. Meyers said that the next step for the research is to discover the functional roles of these small RNAs. "We know they're extremely abundant, we know that they increase in abundance at very particular stages in anther development, and they're dependent on very particular cell layers in the anther, but we still don't know exactly what their functions are. That's a really intriguing mystery because in the functions of almost all other plants, small RNAs are at least generally well-described," said Meyers.